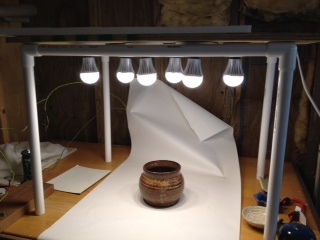 Today, I started building my lightbox for photographing wares. So far, I’ve built the frame and I’ve been using clamp-on work lights. The pictures of the las tear or so have been made with this arrangement. All along, I’d planned to build a better lighting arrangement. Today, I got the hard part taken care of. I now have a base of 6 light fixtures, wired in parallel, to fit over the frame. I still need to finish building the box, but the electrical bits are taken care of. I’m using 6 LED bulbs that are the equivalent of 40W bulbs, for a total of 240W light equivalent brightness, theoretically. The next step is to add sides, a back baffle, a front face piece and a switch on the front. That should be fairly easy to complete. I’ll post more build photos when it’s finished. It’s not a big deal, but it’s a big check mark on the studio to-do list. The motivation came from seeing the beautiful photo of my blue jar from the NC Pottery Center Auction site. I know they’re using a more sophisticated setup, but it made me want to improve my pictures, too. We’ll see how it goes. Hi Richard. I just have the 6 lights overhead. I started using over and beside, but upon studying other setups for pottery, the overhead-only approach seemed more common and provides more depth in the images. I do have a white reflective foam core panel on the left side, which helps with a little passive fill. I’ll take a few more photos of the setup as I’ve been using it, and post those. I still have some modifications in mind, but it’s working well enough for what I need at present. Still, it’s always good to improve. Thanks!